Serbian President Aleksandar Vucic speaks during an interview with Reuters in Belgrade, Serbia, March 21, 2019. The leadership of Serbian President Aleksandar Vucic's ruling Progressive Party (SNS) said on Monday it wanted a snap election to test its popularity a year ahead of schedule and after months of opposition protests. "We did not make a formal decision about early elections, but [the party] presidency decided, with me abstaining, that it wants an early vote. We are closer to early elections than before," Vucic told reporters. He said that SNS party leadership informed Prime Minister Ana Brnabic — who was handpicked by Vucic — about its decision. Under the provisions of the constitution, Brnabic's government must first resign to allow Vucic to set the date for the vote. 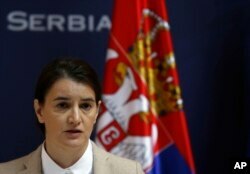 FILE - Serbian Prime Minister Ana Brnabic speaks during a press conference in Belgrade, Serbia, Nov. 21, 2017. "Elections will be either in June or spring next year," Vucic said. "I am authorized by the presidency to enter talks with our coalition partners about the date." According to recent polls, Vucic could secure support of around 44 percent of electorate, while the opposition is trailing with around 12 percent.